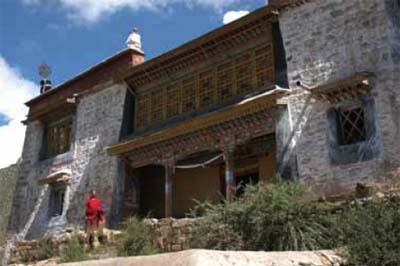 Trashi Chöling – literally “The Place of Auspicious Dharma” – is located about three kilometers from Sera in the mountains northwest of the monastery. It takes about one hour to walk from Sera to Trashi Chöling. The hermitage also lies approximately halfway between two other important hermitages – Pabongka, which is about half a kilometer to the west and downhill, and Tags bstan sgrub phug, which is slightly less than half a kilometer to the east, across a gorge, and then uphill. Trashi Chöling is, together with these latter two sites, one of the main stops on the famous Sera Mountain Circumambulation Circuit, a pilgrimage route that thousands of people from Lhasa and the surrounding area traverse as a merit-making activity on the “Sixth-Month Fourth-Day” religious festival. conforming to the landscape. The two top tiers of the hermitage are now in ruins. The hermitage faces south. As is typical of many mountain monasteries, Trashi Chöling is built in a tiered fashion on terraces that conform to the landscape. The temple of Dorje Shugden. The first two tiers of the hermitage – the monks’ quarters and the main temple still exist today, although we know from old photos and informants’ accounts that they are only a fraction of their former size. 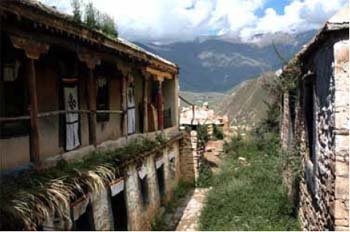 The last two tiers – the private residence of the Lama and the Dorje Shugden temple – are in ruins, and have not been rebuilt. This is perhaps due to the fact that Dorje Shugden is a controversial deity whose propitiation has been banned by the present Dalai Lama. An old photo of Trashi Chöling taken before 1959. It shows the original temple with all four of its floors intact. The set of three windows in the lowest portion of the picture belong to the second floor of the monks’ living quarters. Prior to 1959, the main image on the altar of Trashi Chöling was a statue of Maitreya called the Maitreya as Lord of Men. There was also an important set of images of the Sixteen Arhats, and of Cakrasamvara. All of these have been destroyed or are missing. All of the images in the temple today are new, with the exception of one old statue of Cakrasamvara found on the altar in the northwestern corner of the temple, and this, in fact, may not have originally belonged to the hermitage. The central figures on the main altar are Tsongkhapa (1357-1419) and his two disciples. To the left of these large (one-storey) statues are two smaller statues of the Buddha. To the right of the Tsongkhapa triad are life-size statues of Trijang Rinpoche (1901-1981), Pabongka Dechen Nyingpo (1878-1941), and Jetsun Lama Ngawang Namdrol, purportedly founder of the hermitage. To the right of these, along the eastern wall of the temple, are three funerary stūpas of these same three figures. The top floor of the main temple contains, along its southern wing, (to the east) a reception room, where guests are received, and (to the west of the reception room) the private living quarters of Pabongka Rinpoche. It also contains a kitchen and monks’ quarters. The only remaining portion of the monks’ dormitory is that found in front (south) of the main temple, where two floors of rooms have been preserved. Dungkar Rinpoche tells us that there were twenty-one monks living at Trashi Chöling in 1959, though it seems clear from the number of monks’ rooms at the hermitage that this number does not include supporting staff. If one includes the entire staff of the Pabongka Lama’s estate (ladrang), there could have easily been three times that many men living at the hermitage. Trashi Chöling has had a long and complex relationship to Sera. The hermitage did not become the property of Sera until the early eighteenth century, when it passed into the hands of the Sera Tantric College. In the 1920s or 1930s, the Tantric College donated the hermitage to Pabongka Dechen Nyingpo. From 1930 until 1959, then, the hermitage belonged to Pabongka Lama’s estate. Since that time, it has therefore not belonged to Sera, although it has had informal ties both to the Mé College and to the Sera Tantric College, the two loci of Pabongka Rinpoche’s affiliations to Sera. From the 1990s, when the hermitage was rebuilt, up to the present time, Trashi Chöling has functioned as an autonomous institution with only minimal ties to Sera. The hermitage reverted to Pabongka Lama’s estate after the present incarnation’s recent return to Tibet. The remaining wing of monks’ rooms on the left, and the kitchen on the right. One contemporary Tibetan author states that according to oral tradition, Trashi Chöling may date to the time of the Buddhist king (of Tibet) Songtsen Gampo, that is, to the seventh century, being known at that time not under its present name, but rather as Gdugs yur dgon. The first real evidence we have of a monastic institution existing at the site, however, is much later. According to one contemporary Tibetan historian, Trashi Chöling is the place where the Mongolian ruler of Tibet, Lhazang Khan, housed the monks of his private ritual college during the winter months. We know from different historical sources that Lhazang’s ritual college – the monks who were responsible for performing all of the necessary merit-making and protection rituals for the king – met in Northern Tibet during the summer months, and then moved to a site just north of Lhasa for the winter. Trashi Chöling, it seems, was that site. Jetsun Ngawang Namdrol, seen by the monks who live here as the founder of the monastery. Shortly after Lhazang came to power in 1705, he came to an agreement with the monks of Sera. Seeing that the Sera Assembly Hall – the place where all of the monks gathered for communal rituals – was too small to fit the entire monastic population, he offered to build the community a new assembly hall. The monks, from their side, had to surrender the old assembly hall to the king, who proposed to use it as the permanent home for his private ritual college. An agreement was reached, and the king built what is the Sera Great Assembly Hall. The old assembly hall then became the headquarters for the ruler’s ritual college. After the death of Lhazang in 1717, his ritual college became the Sera Tantric College, an institution that continues to flourish to the present day. 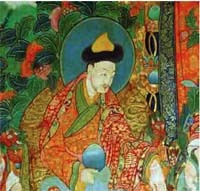 Lhazang Khan (Lha bzang khāng), from a mural in the Sera Great Assembly Hall. Although the monks of Lhazang’s ritual college moved to Sera permanently, it seems clear that they did not give up their rights to their old winter residence at Trashi Chöling in the mountains northwest of Sera. And when Lhazang’s ritual college became the Sera Tantric College, then, of course, ownership of Trashi Chöling passed on to the Sera Tantric College. For 200 years – from the early eighteenth century until the early twentieth century – we know little about Trashi Chöling except for the fact that it was (or so it seems) the property of the Sera Tantric College. Dungkar Rinpoche informs us that there was a tradition that Sera Tantric College had to send twenty-one monks to Trashi Chöling to maintain the hermitage and to enact its ritual cycles, and this is certainly consistent with the facts as we know them. In the early twentieth century, Pabongka Dechen Nyingpo did an extensive retreat in some caves close to Trashi Chöling at a site called Rtags bstan sgrub phug. This established Pabongka’s connection to this general area. Later, when Pabongka Rinpoche’s fame and reputation grew, Sera Tantric College offered the monastery of Trashi Chöling to him as his private hermitage or retreat. 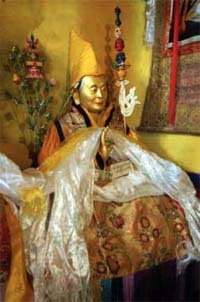 In return, Pabongka Rinpoche agreed to officially enter the Tantric College (an action that brought this institution a certain prestige, given the Lama’s reputation). From that point on, then, Pabongka had two affiliations at Sera: the Tantric College, and the Mé College. Informants tell us that from then on Pabongka Rinpoche lived at Trashi Chöling during the summer months, and in private rooms in a section of the Spo ’bo ra spyi khang at Sera during the winter months. 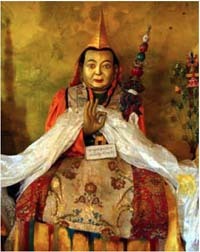 A statue of Pabongka Rinpoche in the main temple at Trashi Chöling. Under Pabongka Dechen Nyingpo, the hermitage was extensively refurbished and expanded. It was perhaps under him as well that a very large temple to the protector deity Dorje Shugden was built on the topmost tier of the complex. Today, as had been mentioned, this lies in ruins. After the events of 1959, Trashi Chöling suffered the fate of all of Sera’s hermitages. Over thirty years of neglect brought the site to the brink of complete collapse. Restoration did not begin until a monk – a student of Pabongka Dechen Nyingpo – undertook the labor of renovating the hermitage as a personal project in the early 1990s. The hermitage is maintained today by two elder monks who serve as temple attendants and caretakers of the site. They also receive help from the nuns of Takten Hermitage (Rtags brten ri khrod), who live just up the hill. This entry was posted on Wednesday, September 22nd, 2010 at 9:32 am	and is filed under Monasteries. You can follow any responses to this entry through the RSS 2.0 feed. You can leave a response, or trackback from your own site. What a fantastic post. I really thank dorjeshugden.com for this beautiful information. May we be fortunate enough to visit this holy pilgrimage site where Pabongka Dorje Chang resided. Where he communed with Heruka, Vajra Yogini and Dorje Shugden. It’s amazing that this hermitage could have been built during the time of Songtsen Gampo in the 7th century! By looking at the old stone walls, it is quite possible. I hope it will be restored to its former glory when Pabongka Rinpoche had it refurbished and expanded and added a temple to Dorje Shugden. I hope to visit this holy place one day. Trashi Choling, a lovely place, though in ruins.It ‘echoes’ strongly of a rich past, especially its very recent past. Its spaces hold the loving memories of the great Pabongka Rinpoche who we can visualize doing retreats and practices here (in this his hermitage) to Heruka , to Vajrayogini and to Protector Dorje Shugden. Fortunately, there has been some renovation work done. And it’s being taken care of by two elder monks and nuns from a hermitage up the hill. Trashi Choling Hermitage first belonged to Sera which was later handed to Sera Tantric College which later was passed to Pabongka Dechen Nyinpo which then became Pabongka estate. In the late nineties when the Hermitage was rebuilt, it then became the autonomous institution with minimal ties to Sera. The Hermitage was reverted back when the present incarnations returned to Tibet. When Pabongka Dechen Nyingpo Rinpoche refurbished the prayer hall he built a large temple for Dorje Shugden. The Hermitage is under the care of two elder monks assisted by nuns from nearby. It was lucky that the project of the ruined hermitage was undertaken single handedly by one of Pabongka Rinpoche’s student to have a temple to continue with the practice of Dorje Shugden. Dorje Shugden The Protector Of Our Time < Loved it!